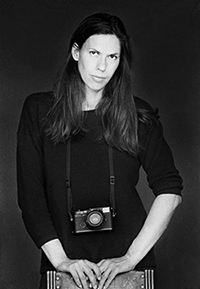 Jutta Benzenberg studied photography at the “Staatliche Fachakademie für Fotodesign” München (DE) and worked afterwards as a photographer for different magazines and theatres. Additionally, she worked with some TV-stations such as BR first as a camera assistant and at the privat TV as a cameraman as well. 1991 she travelled for the first time through Albania with the Albanian writer Ardian Klosi to shoot photographies of those upset times, to capture Albanian portraits and landscapes. After several Albania-journeys Jutta Benzenberg and Ardian Klosi published a book in spring 1993 in Salzburg, Austria, under the title: “Albanisches Überleben” – Albanian Survival at the Otto Müller Verlag in Salzburg. Since then Jutta had many exhibitions on Albanian themes in different cities of Germany, France, Austria, Italy, Switzerland and Albania. Jutta Benzenberg’s and Ardian Klosi’s second book „Bukuri e rëndë“ – „Sombre Beauty“ sponsored by the Swiss culture foundation Pro Helvetia was published in Tirana in 2004. With the photographies of this book she exhibited at the Biennial Arts Festival Tirana (AL), Think Pink (Prishtina, KO), Goethe Institut (Thessaloniki and Athens, GR) among others. 2011 their last book ”Ahead with the Past” sponsored by the Swiss Foundation DEZA, was published by Fotohof Salzburg Austria. and in USA. (Washington DC)Latin America. 2013 to 2014 she worked as the official Photographer of the Albanian Prime Minister Edi Rama. 2015-2017 she was based in Berlin with a project “Albania meets Germany”. Since 2018 she is a member of the Agency Focus in Germany. She also gives Photo Workshops (Storytelling and Portraits) in collaboration with Fotohof Salzburg and in Albania. “Religion in Albania”, supported by the German Embassy Tirana and the Embassy of Vatikan Tirana. “Austrians by Heart”, supported by the Austrian Embassy Tirana. “The Forgotten in Europe”, which is a collaboration with 3 other Photographers from Germany, Belarus, Italy and Goethe Institut Mailand. For the moment she is based in Munich and Tirana.